Objective: This research aims to observe the extent to which several surface treatment techniques increase the surface roughness of titanium alloy implants which was manufactured via electrical discharge machining (EDM). The effects of these techniques were also observed to decrease the Cu content on the implant surface. Materials and Methods: In this research, ultrasonic cleaning, rotary tumbler polishing, and brushing were employed as techniques to increase the roughness of a titanium implant which was manufactured via EDM, to the moderately rough category, and to reduce the contaminant element deposited on its surface. An MTT (3-(4,5-dimethylthiazol-2-yl)-2,5-diphenyltetrazolium bromide) assay test was also used to observe the effect of these engineered specimens with respect to mesenchymal stem cells’ proliferation. Results and Discussion: The results show that ultrasonic cleaning and rotary tumbler polishing created a significant increase (90% and 67%, respectively) in the surface roughness. On the other hand, brushing was shown to be the best benchmark for reducing the contamination of Copper (Cu). Furthermore, rotary tumbler polishing and brushing can increase the percentage of living cells compared to the original surface EDM specimens. Conclusion: All micro-finishing methods that were employed are able to increase the surface roughness of Ti alloy based-implant to moderately rough category. L. Le Guéhennec, A. Soueidan, P. Layrolle, and Y. Amouriq, "Surface treatments of titanium dental implants for rapid osseointegration," Dental materials, vol. 23, pp. 844-854, 2007. A. Jemat, M. J. Ghazali, M. Razali, and Y. Otsuka, "Surface modifications and their effects on titanium dental implants," BioMed research international, vol. 2015, 2015. J. Gallo, M. Holinka, and C. S. Moucha, "Antibacterial surface treatment for orthopaedic implants," International journal of molecular sciences, vol. 15, pp. 13849-13880, 2014. B. Chehroudi, S. Ghrebi, H. Murakami, J. D. Waterfield, G. Owen, and D. M. Brunette, "Bone formation on rough, but not polished, subcutaneously implanted Ti surfaces is preceded by macrophage accumulation," Journal of Biomedical Materials Research Part A, vol. 93, pp. 724-737, 2010. A. Wennerberg and T. Albrektsson, "Effects of titanium surface topography on bone integration: a systematic review," Clinical oral implants research, vol. 20, pp. 172-184, 2009. K. Vandamme, I. Naert, J. Vander Sloten, R. Puers, and J. Duyck, "Effect of implant surface roughness and loading on peri-implant bone formation," Journal of periodontology, vol. 79, pp. 150-157, 2007. S. Grassi, A. Piattelli, L. C. de Figueiredo, M. Feres, L. de Melo, G. Iezzi, et al., "Histologic evaluation of early human bone response to different implant surfaces," Journal of periodontology, vol. 77, pp. 1736-1743, 2006. J. E. Ellingsen, C. B. Johansson, A. Wennerberg, and A. Holmén, "Improved retention and bone-to-implant contact with fluoride-modified titanium implants," International Journal of Oral & Maxillofacial Implants, vol. 19, 2004. Y. T. Sul, B. S. Kang, C. Johansson, H. S. Um, C. J. Park, and T. Albrektsson, "The roles of surface chemistry and topography in the strength and rate of osseointegration of titanium implants in bone," Journal of biomedical materials research Part A, vol. 89, pp. 942-950, 2009. A. Hasçalık and U. Çaydaş, "Electrical discharge machining of titanium alloy (Ti–6Al–4V)," Applied surface science, vol. 253, pp. 9007-9016, 2007. H. Tapiero, D. Townsend, and K. Tew, "Trace elements in human physiology and pathology. Copper," Biomedicine & pharmacotherapy, vol. 57, pp. 386-398, 2003. M. Rubianto, "Biokompatibilitas bahan allograft (human bone powder) dibandingkan dengan bahan alloplast (hydroxylapatite)," Kumpulan naskah Temu Ilmiah Nasional I (TIMNAS I) FKG UNAIR, pp. 507-9, 1998. C. Telli, A. Serper, A. L. Dogan, and D. Guc, "Evaluation of the cytotoxicity of calcium phosphate root canal sealers by MTT assay," Journal of endodontics, vol. 25, pp. 811-813, 1999. E. C. Jameson, Electrical discharge machining: Society of Manufacturing Engineers, 2001. 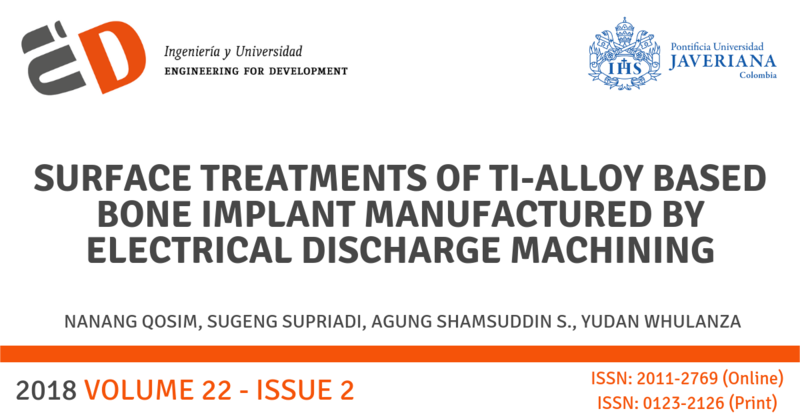 N. Qosim, S. Supriadi, Y. Whulanza, and A. Saragih, "Development of Ti-6al-4v Based-Miniplate Manufactured by Electrical Discharge Machining as Maxillofacial Implant," Journal of Fundamental and Applied Sciences, vol. 10, pp. 765-775, 2018. J. Rahyussalim A, T. Kurniawati, D. Aprilya, R. Anggraini, G. Ramahdita, and Y. Whulanza, "Toxicity and biocompatibility profile of 3D bone scaffold developed by Universitas Indonesia: A preliminary study," in American Institute of Physics Conference Series, 2017. A. F. Kamal, D. Iskandriati, I. H. Dilogo, N. C. Siregar, E. U. Hutagalung, R. Susworo, et al., "Biocompatibility of various hydoxyapatite scaffolds evaluated by proliferation of rat's bone marrow mesenchymal stem cells: an in vitro study," Medical Journal of Indonesia, vol. 22, p. 202, 2013. R. P. Singh, S. Kumar, R. Nada, and R. Prasad, "Evaluation of copper toxicity in isolated human peripheral blood mononuclear cells and it's attenuation by zinc: ex vivo," Molecular and cellular biochemistry, vol. 282, p. 13, 2006. N. Aston, N. Watt, I. Morton, M. Tanner, and G. Evans, "Copper toxicity affects proliferation and viability of human hepatoma cells (HepG2 line)," Human & experimental toxicology, vol. 19, pp. 367-376, 2000.